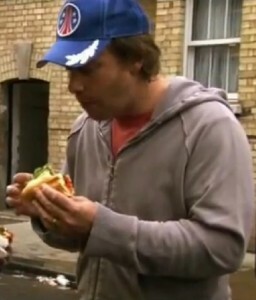 Jamie Oliver eating Bahn Mi in east end London, from Jamie's Great Britain. Screen shot from YouTube. Jamie Oliver has made a name for himself as a celebrity chef who has sought to improve the way we eat. Whether it be his instructional cooking or his fight to reform school cafeterias, Oliver has spent over a decade teaching us how to make food, and urging us to think more about it. Some of his series have explored different national food cultures. In Jamie’s Great Italian Escape, he tried to answer why Italy has a lower GDP than the United Kingdom, yet its people enjoy a healthier diet. Oliver traveled across the USA in Jamie’s American Road Trip, while he showed us that despite outside stereotypes of a monotonous fast-food culture the country has a diverse number of cuisines based on its many different regions, histories, and people. His newest show is called Jamie’s Great Britain, and its argument is a historical one: the foods that many Brits see as traditionally “British” weren’t always so. The series is one example of connections between historical perspectives and food culture in popular media. Jamie Oliver walking through east end London, from Jamie's Great Britain. Screen shot from YouTube. The series’ first segment starts off in the east end of London, where he notes different immigrant groups arrived before continuing their journey outwards. As he walks through Whitecross Street Market, he describes an unspecified earlier era, “back in the day,” when the area was known as Squalor Street, filled with street vendors and the mixing of immigrant cultures. Another immigrant group to make the east end home is the Vietnamese, who came as refugees to Britain in large numbers during the Vietnam War. Oliver chats with two workers at a food stall selling Bahn Mi. The sandwich is a mix of Vietnamese ingredients like red chilis, cilantro, and pork shoulder in a French bread slathered in mayonnaise. Oliver points out that it is also an artifact of history, a product of the French colonization of Southeast Asia during the nineteenth century. Oliver is taking apart the popular myth that there is one authentic, static, British food culture. His point about Fish and Chips shows such an intention. This is a political exercise. It repudiates a corresponding idea that thinks there are Brits who have a more traditional claim to Britishness, ie white Anglo Saxons, compared to more recent inhabitants of the island, many of whom are people of colour. By underlining the ways in which Britain’s food culture is historically contingent and a constant process of evolution, he shows that its populace, also ever changing, mirrors this phenomena. As Jamie’s Great Britain illustrates, food history is a fruitful historical subject. Food, after all, has been essential to the survival and everyday experience of all people living in the past. It has also served as a key aspect in the development of human culture: the signs, symbols, and practices that we use to understand the world around us. These factors help to make food history a topic with much popular appeal. Everyone eats. And recently there has been a growing interest in food, whether it be the popularity of Food Network or farmers markets. A number of popular history books, some of which have become New York Times best sellers, have catered to this interest by examining the history of specific foods or ingredients like cod, sugar, chocolate, bananas, coffee, oysters, and corn. Mark Kurlansky’s Salt: A World History (2002), for example, traces the culinary origins of the mineral and its importance to various cultures. Even popular books about food without an explicitly historical dimension make arguments based on particular perceptions of the past. Food historian and ActiveHistory.ca contributor Ian Mosby has shown this with Michael Pollan’s 2009 bestseller, Food Rules: An Eater’s Manual. Pollan writes: “Don’t eat anything that your great-grandmother wouldn’t recognize as food.” This rule is based on a nostalgic understanding of the past, of an earlier time before factories made food (despite the fact that Jello was invented in 1897, Mosby points out). In Canada, food history is a growing field. Lily Cho’s Eating Chinese: Culture on the Menu in Small Town Canada (2010) looks at the role of Chinese immigrants within the Canadian restaurant industry and the ways in which such spaces have connected Chinese Canadians and people of other ethnic backgrounds. The next few months will see the release of Edible Histories, Cultural Politics: Towards a Canadian Food History, a collection of chapters edited by Franca Iacovetta, Valerie J. Korinek, and Marlene Epp that is sure to continue this trend by exploring how food links to wider historical themes like religion, immigration, politics, gender, and science. However, food has long had a subtle yet significant place in Canadian history books. One only has to think of the importance of cod and wheat to the Staples Thesis of Canadian development, or the role of food shortages in the rebellions of 1837. Oliver’s argument about the heterogeneity of British food culture would probably come as less of a surprise to people living in Canada, a country whose recent national identity has been built more explicitly around immigration and multiculturalism. Our national food culture is also certainly one of evolution, ever changing with new developments in technology (for example, deep freezers), economy, and cultural influences. With food, we can see how the quotidian things of our everyday lives are not timeless. They have a history that appeals to wide audiences. And as Jamie’s Great Britain shows, these histories can make more palatable a larger argument about the need for cultural acceptance. What a great article! This should grab everyone’s interest and hopefully they will become more interested in the history of many topics in their modern world. You have blended most couples common interest, FOOD, into a history topic. This could be a great conversation starter at many homes. History …while you eat of what you are eating.